It can provide for a Tax-Free income stream! Life Insurance is a cutting edge solution for most individuals or businesses. It offers many benefits that are not offered with traditional plans. Which plan is the right plan for you? 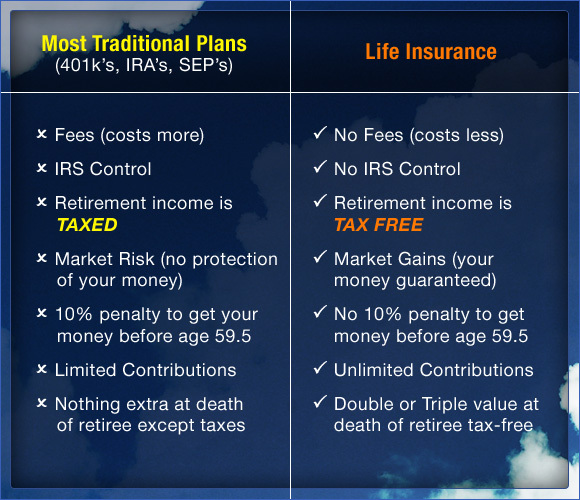 Let's compare traditional retirement plans with Life Insurance. It can plainly be seen that traditional plans may not be the best solution for your company or employee's retirement needs. For businesses, the benefits for Life Insurance far outweigh the benefits for the traditional plans. If you are interested in offering Life Insurance for your employees or just yourself, please contact us. We appreciate your interest and look forward to working with your company.